As we are on the path towards the strategic roadmap of ASEAN ICT Master Plan 2015 to harness ICT to drive all strategic initiatives for ASEAN Economic Community (AEC), Cloud Computing has definitely presented the potential to enable ASEAN’s social and economic integration. 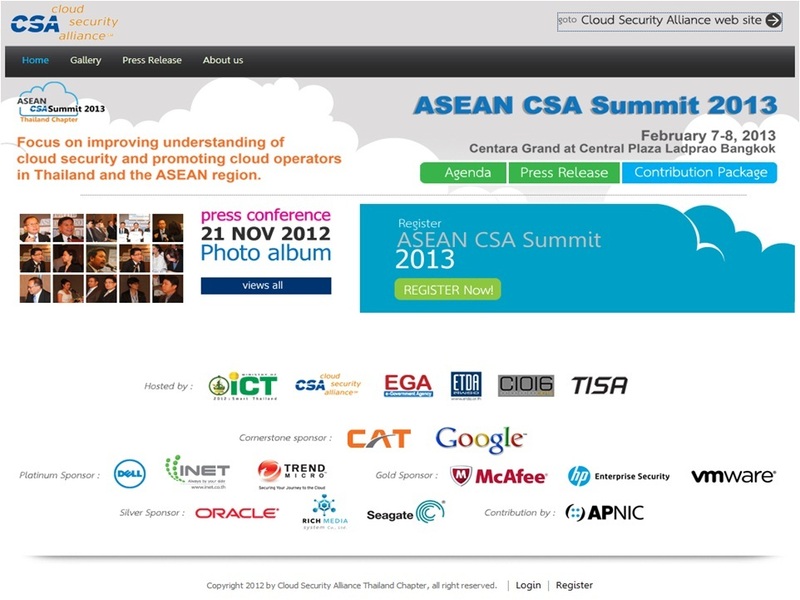 The aim of the ASEAN CSA Summit- Bangkok 2013 is to build shared understanding in the role of cloud computing on ASEAN economy and its impact on business at national level as well as ASEAN level through public- private partnership (PPP) initiatives. There are several important factors and issues concerning both opportunities and challenges business and IT executives need to consider when making Cloud adoption decision. Despite its potential business values such as cost savings, flexibility, and better resource optimization, several relevant risks have emerged and those, if left unmanaged, will prevent us from realizing business benefits of clouds. To achieve value realization as well as risk optimization of Cloud technology- both Public and Private platforms, it is crucial for every organization and country to pursue an integrated management approach, known as Integrated-Governance, Risk, and Compliance (GRC) or Integrated IT-GRC. That said, not only Value driver but also Risk driver of cloud computing has to be considered, well understood, and managed properly at all organizational levels and stakeholders. 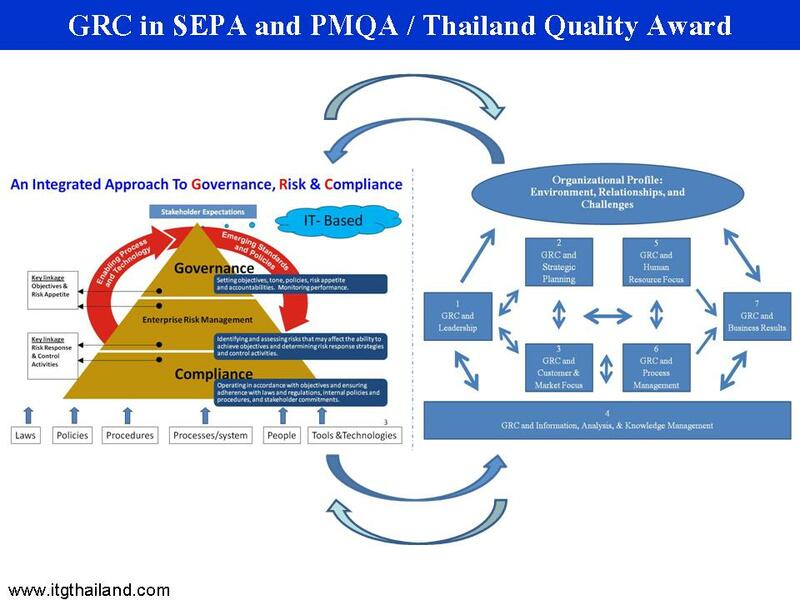 It is essential for the management committee/board to assure the alignment of ASEAN goals and Enterprise goals which need to be cascaded down to IT-related goals regarding Cloud Computing environment with respective proper measures and target outcomes in order to monitor and evaluate value realization of cloud investments. Such alignments ought to address all the needs and concerns from various stakeholders including governments, citizens, businesses, and users with respect to expected value and risk appetite in order to achieve optimal level of enterprise performance and conformance. 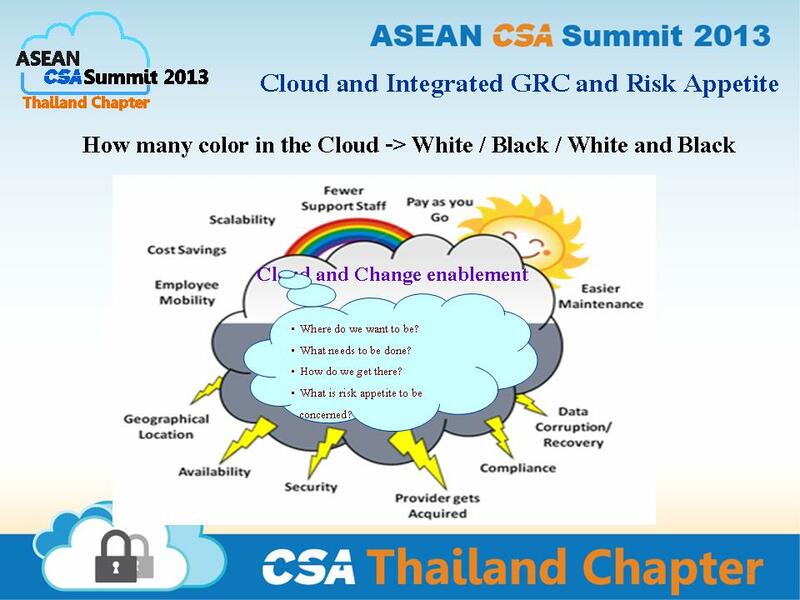 In sum, ASEAN CSA Summit –Bangkok 2013 is a forum for sharing, discussing, collaborating, and setting a common direction for ASEAN Cloud Computing initiatives. 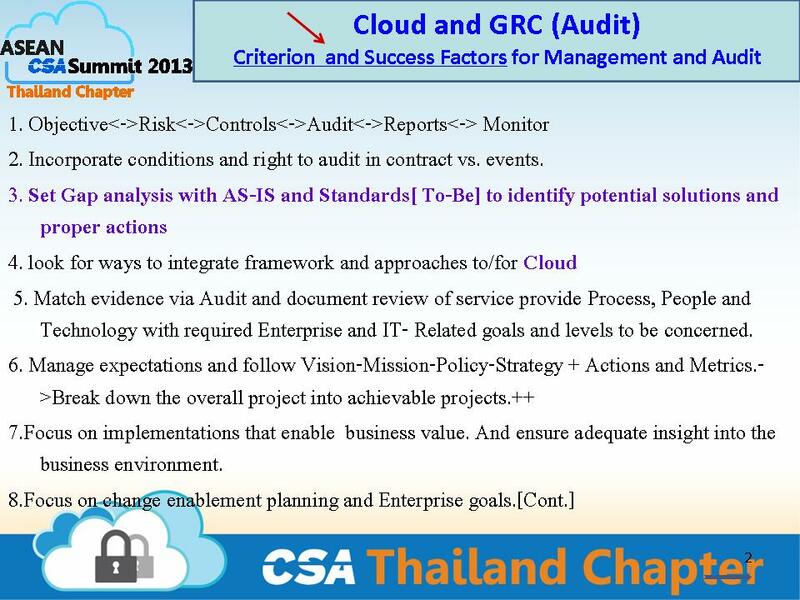 The summit offers various sessions to discuss current critical gaps Cloud Security Alliance-CSA has against standards, good practices, and frameworks regarding IT/IS security driven by enterprise goals and ASEAN goals. 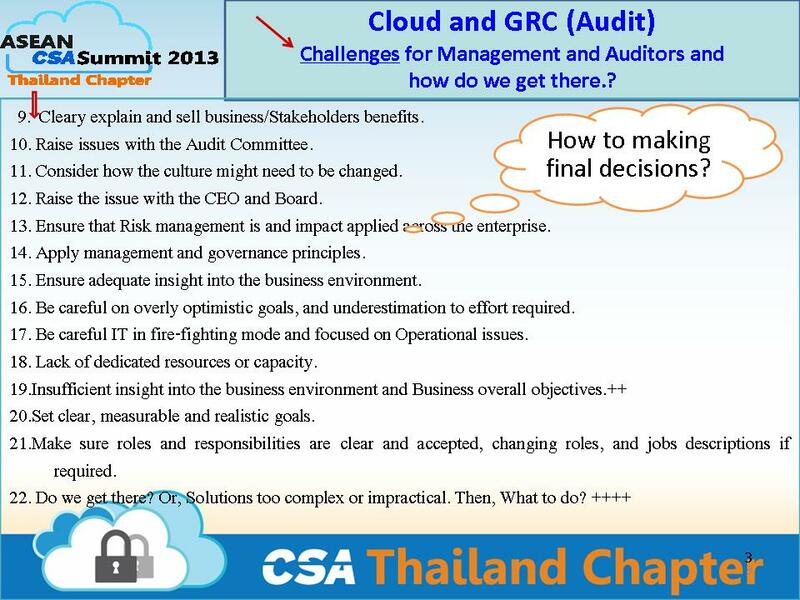 The possible solutions to address those gaps at enterprise and national levels will also be discussed to provide guidance for CIOs, business leaders, and government agencies to consider and pursue in order to achieve benefits realization and effective risk management of Cloud Computing, as well as to optimize ICT resources.